After the end of the Revolution the Continental Army was disbanded in 1784. By 1784, only a small group of artillerymen were left as Congress was wary of establishing a regular army. However, with a large frontier to defend, Congress soon realized a need for a larger force. Thus, it created the First American Regiment. 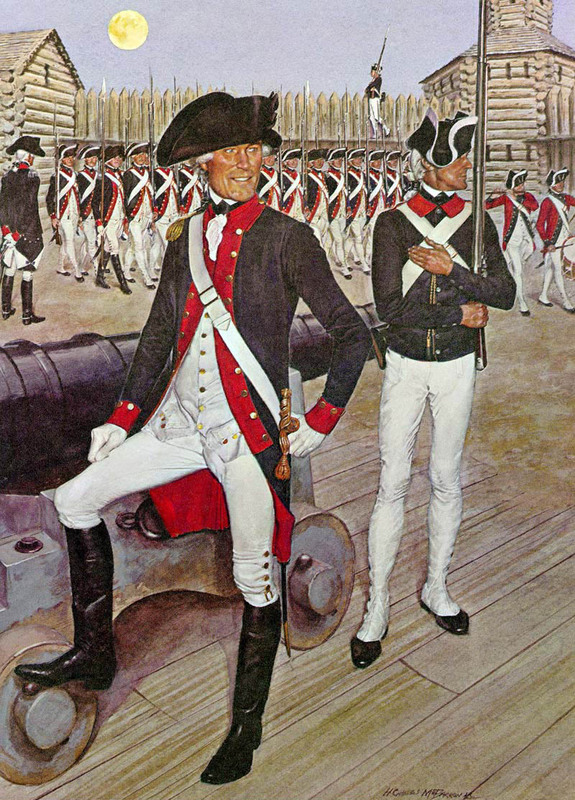 The regiment was organized on 3 June 1784, and was to consist of 700 men from Pennsylvania, New Jersey, New York and Connecticut. Eight infantry and two artillery companies comprised the regiment. Pennsylvania had the highest allotment of troops to fill, and thus could select the regimental commander. Thomas Mifflin, the president of Congress, recommended his former aide Josiah Harmar, who was named to the post of lieutenant colonel commandant. Command of the regiment involved complicated and confusing lines of authority. The Congress, still a weak and ineffective body under the Articles of Confederation, exercised direct control. A Secretary at War administrated the orders of Congress. The First American Regiment did not fare well in its early days. Pay was low – $6.67 a month for a private – and the regiment still could not fill the 700-man roster by 1789. Moreover, Congress did not clothe, feed or equip the small force properly. Under Harmar, the Regiment was posted to the old Northwest Territory, now Ohio, Indiana, Illinois, and Michigan. It was charged with carrying out four main missions: controlling immigration to the new lands, building forts, negotiating treaties with the Indians, and protecting surveyors and settlers in the area. While supplies were often limited, the Regiment usually possessed more than enough weapons. The soldiers utilized Revolutionary War firearms, such as the French .69 caliber musket of the Charleville pattern. Pressed by increasing numbers of American settlers, and encouraged in part by British agents, the Indians forcefully resisted American expansion, and settlers responded in kind. In 1790, in response to the Indian attacks, Harmar led the First American Regiment against the Indians. Leaving Fort Washington (near present-day Cincinnati) he headed north on 26 September. Harmar faced difficult supply and manpower problems; his men were scattered and there was no organized supply transport. Moreover, the integration of the Kentucky militiamen into the campaign proved difficult. Many Regular officers scorned them, and few militia had any military experience. However, they provided crucial forces for his operation. On 19 and 22 October, Harmar attacked the Indians at the Miami Villages, at the confluence of the Saint Mary and the Saint Joseph Rivers. The Indians, led by Little Turtle, defeated the Army in confused and desperate fighting. Harmar withdrew with heavy losses and soon was replaced by MG Arthur St. Clair. St. Clair led the reconstituted Army of Regulars and militia back into Indian territory in September 1791. Again, numerous difficulties beset the force. St. Clair built a small fortified supply point called Fort Jefferson, and he tried to regroup his force. By late October, the high desertion rate alarmed St. Clair so greatly that he ordered three captured deserters executed as an example to the rest of the men. The weak state of his force compelled St. Clair to set out on the offensive. After several days, he ordered the First Regiment to find and to protect an overdue supply train. Under the command of MAJ John Hamtramck, the Regiment turned back toward Fort Jefferson, but by 3 November, it had not found the supply convoy. The next day as the men marched to rejoin St. Clair’s army, they heard fighting several miles ahead. The Indians had attacked early in the morning, catching St. Clair totally unprepared. Again led by Little Turtle, the 1,040-man Indian force surprised and routed the Americans. Over half of the 1,450 men were killed or wounded in three hours. As the survivors broke through the Indian lines, they ran into the First American Regiment and warned MAJ Hamtramck of the battle. Hamtramck, instead of rushing up to support St. Clair or covering the retreat and saving some of the wounded, fell back to Fort Jefferson. Thus, while the First American Regiment was spared from the terrible horrors of the battle, it also failed to aid its comrades as they retreated. On 29 September 1789, the First American Regiment became the Regiment of Infantry. Two years later, on 3 March 1791, it was redesignated the 1st Infantry. The next year it became the Infantry of the 1st Sub-Legion. On 31 October 1796, it again became the 1st Infantry. In October 1815, the 1st Infantry was consolidated with the 5th, 17th, 19th, and the 28th Infantry to form the 3d Infantry. This established the 3d Infantry as the oldest regular regiment in the U.S. Army.